The TreeView control displays a hierarchical list which may contain text, check boxes, images, or arbitrary HTML content. A treeview is typically used to display the headings in a document, the entries in an index, the files and directories on a disk, or any other kind of information that might usefully be displayed as a hierarchy. The TreeView control manages data through nodes that can be selected, edited, and used to display simple text, images, and other elements such as check boxes. Bind/Source - An array that contains the hierarchical data. Each item in the array contains information about a node and (optionally) an array of child nodes. DisplayMemeberPath - Defines the name of the property in the items that contains the text to be displayed in the tree nodes. By default, this property is set to the string 'header'. ChildItemsPath - Defines the name of the property in the items that contains the array of child nodes. 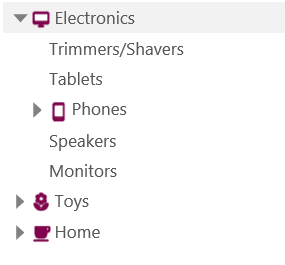 By default, this property is set to the string 'items'. Apart from these properties, TreeView also offers properties for binding node images, check boxes, and collapsed state to the itemSource array. For more information, see Features.